Dedicated to Afiq and Muaz.You can also read the other version of the story,Stray. Anyhow,you can stop reading when you reach the happy ending. Disclaimer:The story is fictional and has no reference to real life,especially the name of the 3 Bears. There was once a boy who had a cat, one that was very playful and funny that it always make the boy happy. One day, the boy went for a hike in the mountains with his cat in tow.As he passed a giant mulberry tree,the boy tripped over the tree roots and almost fell over the mountain.Upon seeing its master clinging for his life,the cat jumped and pushed his master away from the edge.The cat however, fell into the ravine. "Why are you crying boy?" "I've lost my cat,"said the boy before bursting into another loud wail. "Now,now,don't be sad.You're cat is still alive,"
"Really?" The boy abruptly stopped crying. "Actually he is now in the Land of the Bears and I'm afraid he won't be safe there for long. "But,but it fell into the ravine.How could he,it,be in the Land of the Bears?" "Your cat fell and landed in the Dark Forest and later was taken by one of the Bears.Now, it is no use of you asking me questions because I am afraid that your cat could be in danger in the hands of the Bears.Now,if you would go now,you could still save him. The boy's sadness was replaced with bewilderment and incomprehension,trying to understand what the man was saying,while at the same time the man was slowly guiding the boy the edge of the cliff. "If you want to save your cat,you must jump." "But..but what happens when I fall?What should I..."
The boy left the sentence in mid-air,as he turned around and saw that the man had vanished. The boy turned back and jumped. He opened his eyes to find his whole body covered with white,sticky jelly.A pool of them actually and he was right in the middle.Slowly the boy waded the pool and climbed out of it when suddenly he heard a voice. "Is anyone there?" said the voice. The boy looked around and saw no one,no one that is except a snail. "Is anyone there?I'm certain I heard someone.Oh how I wish I could simply see,"said the voice. It was undoubtedly from the snail,so the boy introduced himself to the snail,in which the snail requested the boy's help. "I'm afraid I'm in quite a hurry right now.I have to go find and save my cat," declined the boy. "A cat eh?I heard one a few hours ago,and I could tell you the way to the Land of the Bear,if you would lead me to the nearest mulberry tree," bargained the snail. The boy considered so he looked around and saw a mulberry tree just a few feet away,thus he agreed to help the snail.Not wasting any time,the boy picked up the snail and was about to take a step forward when a loud screeching scream came from the snail.The boy was so shocked that he let go of the snail immediately,letting it fall to the ground. "Do not ever pull me off the ground again!I said you were to lead me,not to pick me up!Now,slowly walk to the tree and I will follow the sounds of your footsteps." The boy then followed the snail's bidding but apparently the snail was so slow that even if the boy was to move on his stomach,he would still lead the snail by a mile.In the end it was already dark when the snail finally arrived at the mulberry tree,led by the boy who was waiting patiently. "Now that I have helped you,will you tell me the way to the Land of the Bears." The snail yawned and said,"Yes, yes.It is quite easy actually,or so I heard.You just follow the setting sun." "But the sun has already set!" said the boy the snail. 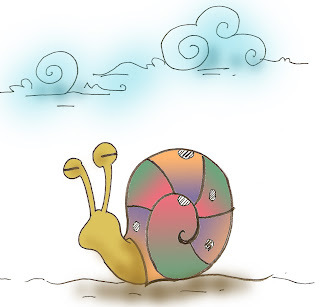 However the snail was already asleep and only its snores were its reply.The boy was frustrated that he wanted to squashed the snail but stopped.He thus sighed and sat down leaning on the tree forlornly. "Now i will never find my way to the Land of Bears in time." Illustration of the snail done by Kiambang. Suddenly a bug dropped on the boy's shoulder.It was a beetle with a lighted end,just like a firefly,which flashed repeatedly as it flew in front of the boy.
" I know the way to the Land of the Bears," said the bug with a happy voice. "Really?Can you please tell me then?" asked the boy eagerly. "Absolutely.Just follow me.By the way my name is Cheerio.I was just sleeping on the tree when i heard your voice,so I came down to see you.In fact it was not the first time.I still remember the first time,and that was when I was still a small beetle,barely changed my skin,still wet behind my pincers,that one day...."
Thus the boy walked through the Dark Forest in the night guided by Cheerio's light and chatters,taking strides after strides,forcing his exhausted body to go on. "....so suddenly a bird came swooping down.Oh!We're almost there.Just watch out the slippery bank." The boy was about to ask when suddenly he slipped and slided down the bank,into a flowing river,bobbing up and down,barely able to fight the current. "They never listen," said Cheerio. "Oh well,goodbye then!" The boy was unconscious when Eman the Bear took the boy out of the river.Eman quickly brought the boy home and showed it to his son. "Look Edin,I found you a doll.You can play it with your cat." The boy was however still wet so Eman asked his wife Emon to dry it by the fireplace,but Emon being a clumsy bear,accidentally let the boy's shirt caught fire.The boy was then shot wide awake that he screamed out aloud,startling the 3 bears. "My master!He's alive!" said the cat as it ran to its master. The boy finally managed to put out his burning shirt,as he hugged his cat.Edin tried to take the cat back and pulled its by the tail.The poor cat screamed in agony as it was tugged in two directions when suddenly pop! The cat's tail snapped. The boy quickly took the chance and ran away with his cat.The 3 Bears however was also quick in pursuit riding on their horses.Eeeeee sounded the horses as the Bears cornered the boy at the river.Running out of choices,the boy jumped into the river.However luck was on their side as that moment a tortoise came by and the boy and his cat landed directly on its back,all safe and dry.The Bears just watched from afar angrily,before returning back to their home. The tortoise took them back to the boy's village,where they lived happily ever after,except sometimes when the cat felt sad having a short tail. A body of a boy was lying on the rocks with its face downwards,or what's left of it, with blood splattered ,as if the boy had fallen from the sky face-flat. "There's another one there.Only a cat though." "The boy must have been pushed or something.I wonder what devilry is this." careful faris. byk sgt typo nih. makcik makmal:samir on klakar ek? muaz:bear tu naik kuda,maskot GMI.